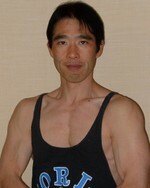 ボレロ、録画したもんね（笑）: Exercise & Language Instructor Fitness journey ENDO's Walk on ! last night, sylvie guillem's bolero was aired on tv in japan and i watched it! her performance was really amazing and overwhelming!! bolero lasts about nearly 20 minutes and consists of many high leaps and dynamic movements and poses like what is called attitude, which requires continuous muscle tention. but her breath never break and she is always elegant and graceful on stage. and i founded that her age is just the same as i ,on the internet. of course i dont have any experience practicing ballet, but i know ballet and bodybuilding have some common aspects. that is .....the both are a way to express human body, emotion and inner self. in that point, i have become a great fan of her, watching yesterday's on air.